It was a fantastic wine fair in Montepellier. I was invited by Sud de France to take part in the Millesime Bio, as the Brand Manager from Otto Suenson. It was a wonderful experience, to meet with a lot of wine importers from other countries, talking about the similarities and differences between our different markets. I especially enjoyed talking with very kind people from different states of USA. It was also terrific, to meet with new friends from the Nordic countries; Sweden, Finland and Norway. We had some nice days, tasting wines from at least organic certified wine producers. I tasted wines from Italy, Austria, Spain and especially France. Millesime Bio is a very interesting wine fair; every producer gets assigned a table, in the order they sign up, so it all seems like big mess, with different regions next to one another. As a taster, this demands that you are paying attention, but also makes it a bit fun just to walk around and get inspired. For me, it’s not that important whether the wine is organic, but I prefer hand crafted wines, made with a lot of attention and care. In this gathering, that was what I tasted a lot of. I even tasted some very nice “natural wines” fermented in Amphora, full of taste and a lot of personality. As at every wine fair you will attend, you also end up tasting lots of crap. Overall I was very satisfied, and it’s a fair I will try to attend in the future. It’s also very nice to be back at work again. Friday we said goodbye to a good colleague, who will start to study again. Another one of my kind colleagues decided that we should say goodbye in the best manner with these two wines, that were served blind at lunch. Let me start by saying that we rarely guess two wines so precise, we must have been in a very good mood. Also, not to forget; two fantastic classic wines, served at optimal maturity. Thank you for bringing these wines to the table. 2007 Domaine des Comtes Lafon, Meursault Perrieres, 1’er Cru – very elegant with classic Meursault butter notes. The acidity stood strong and gave nice freshness. 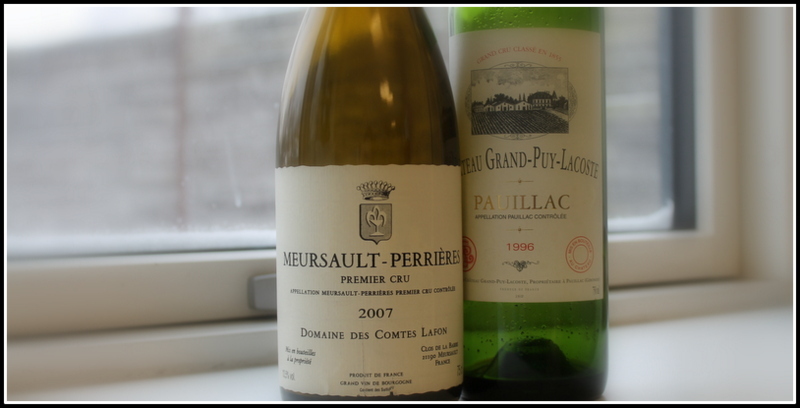 There was no doubt in the room that this was a strong showing for a good mature Meursault. The combination of nice mature tropical fruit flavors was well integrated with oak notes and kept in place by the nice fresh acidity. A powerfull wines, that just got better from sitting in the glass. My guess: Meursault ’02. One of the regions absolute top producers of white Bourgogne in all categories. This Perrieres is always recognized as being one of the best Meursault 1’er Cru wines. All vineyards are farmed according to biodynamic regulations. 1996 Château Grand Puy Lacoste, Grand Cru Classé, Pauillac – stand strong, this wine just screams Bordeaux right from the first sniff in the glass. I found clear notes of black currant and black berries. Mature notes of leather and tobacco, is following in a well-balanced way. Tannins show great maturity and is balanced by nice fruit acidity. The element of fresh pencil was so typical Pauillac that we managed to guess the right commune on two wines in a row. My guess: Pauillac, perhaps Pichon Baron, 1995. A classic fifth growth from Pauillac. This Chateau has a tendency to be underrated, but always performs very steadily. The wine is made from mostly Cabernet Sauvignon and has great ageing potential. The vineyards are situated on the vest side of the commune, just above Bages. Once again; thank you Sud de France for the invitation to Millesime Bio. And thanks to my colleague for bringing these wines. 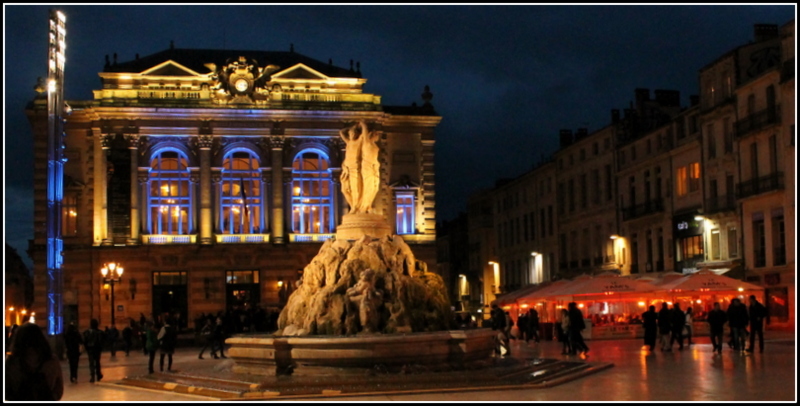 You could also read about a lovely dinner, down town Montpellier at Le Carre.